Depending on where you are in the world, tipping varies. In the United Kingdom, you don’t tip in cash, but you would offer your bartender a drink. In Japan, tipping is an insult. But, if you are in the United States and Canada, tipping is expected. Here are some of my top tips for tipping bartenders. No one ever gets poor because of a generous tip. Basically, tipping is a way of showing appreciation for the excellent service and attention from your bartender and besides, lack of tipping is just bad karma. While considering how much to tip for your bartender, it is important to remember that they rarely receive health insurance or paid leave. In reality, a bartender position offers very little job security. And the lack of this steady income along with the lack of benefits is why bartenders rely heavily on their tips, in order to pay the bills. 1. Don’t hold the bartender personally responsible and dock his/her tip. If you have to wait a while before being acknowledged and served, understand that a busy bar just means that you have entered a good establishment. 2. Do tip per drink. $1 to $2 for a draft beer is customary, more complex drinks should be tipped $2 to $3 each. Basically, the longer the bartender spends on preparing your drink, the higher the tip should be. 3. Do know when to tip more. 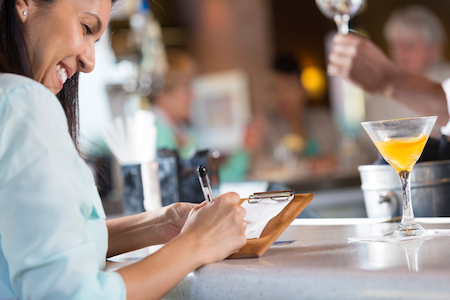 Happy hour is time to enjoy discounted cocktails, but tipping should be increased, as the bartender’s time is not discounted. $2 per drink is appropriate in these situations, and if you are paying via a credit card, then a 25% (instead of the standard 20%) tip is appropriate and appreciated. 4. Don’t point out your tip to the bartender. We know that you want to be recognized for your generosity, and believe me; a good bartender knows who is leaving how much. 5. Do tip more for over-the-top customer service. If your drink was made perfect, and service was quicker than expected, it is advised to reward the bartender for this extra attention to detail. 6. Don’t leave money on the bar, as this is considered a tip for the bar-back and bartenders. Only leave money on the bar that is intended as tip, all other cash should be promptly put back in your pocket. He makes enough (did you know that bartenders get a very low hourly rate, and their tips are how they pay the rent? ).